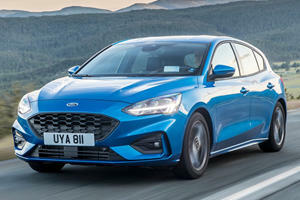 Both the Ford Focus’s 160hp 2.0-liter and 123hp 1.0-liter engines feel overwhelmed by the size of the focus; letting down a superb front-wheel drive only chassis and a good manual gearbox. A self-shifting 6-speed dual-clutch Powershift transmission is also available. The top trim level – Titanium – gets the premium equipment like SYNC 3, heated leather seats, and remote start. Optional safety equipment includes blind spot monitoring and lane keep assist, though no forward collision avoidance systems are available. 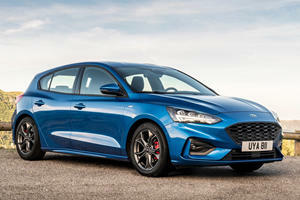 The ST and RS versions are crazy fast and loads of fun, but the Mk3 Ford Focus in its lower trims sheds the fast paced mask of hot hatchery to focus, pun unintentional, on being a good civilian vehicle – available in either hatch or sedan body style. But this segment isn’t an easy one, with the Hyundai Civic and VW Golf offering a dash of premium, and the Mazda 3 having dynamic appeal. In this company, the Ford’s age – 6 years – could count against it. Could its European engineering counter that? Ford hasn’t quite caught on to the notion of developing a premium interior in a sub-premium segment. The Focus’s interior is one of the dreariest in class, with lots of gray, scratchy plastics all over. That said, the dash layout is simple and easy to use and understand, and if you select the right trim level you’ll get Ford’s intuitive and easy to use SYNC 3 system with touch screen, Apple CarPlay and Android Auto integration. The driving position is great, low enough to sink into the car, but commanding enough to give great visibility. Up front there’s also plenty of interior space. Sadly, that doesn’t continue to the rear where the Focus is one of the most cramped in class, with taller occupants finding leg room to be particularly tight. Trunk space is ample, though not extraordinary, with 13.2 cubic feet in sedan trim, and 23.3 cu ft in the hatch. An electric variant is available, but for most, the combustion powered models will be the default choice. 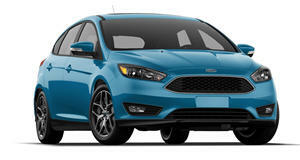 A 2.0-liter engine develops 160 horsepower and 146 lb-ft of torque to drive the front wheels through a 6-speed manual (5-speed in base Focus S Sedan) or a clunky 6-speed Powershift dual clutch automatic – the latter being the only option in the hatch. An optional 1.0-liter turbo 3 cylinder develops 123hp and 125 lb-ft, but both engines feel overwhelmed by the Focus’s size. The 1.0-liter boasts the best claimed consumption figures of 30 city MPG and 40 highway MPG with a manual gearbox. 4 trim lines are available; S (sedan only), SE, SEL, and Titanium. The S cuts amenities like power rear windows to create a cheaper entry point, but can feel poverty-spec. The SE gets cruise control and an optional heated leather steering wheel, while SEL models get dual-zone climate, and SYNC 3 as standard. The Titanium trim gets all SEL amenities, plus heated leather seats and shift lever, and remote start. Optional safety equipment on the Titanium includes blind spot assistant and a lane-keeping system. 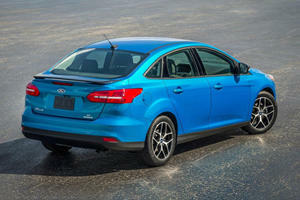 The Focus scored 5 out of 5 stars in NHTSA testing, with predominantly Good results from the IIHS. There's only one way to avoid it.